Japanese language version of ZIMS now available! 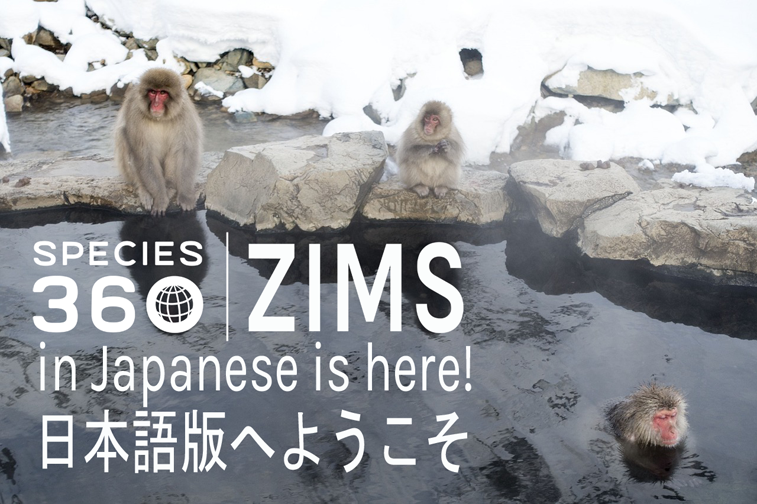 (February 6, 2018) In collaboration with JAZA and our Japanese members, Species360 is pleased to announce the release of a Japanese language version of ZIMS (Zoological Information Management System). The Japanese ZIMS translation is available to users who select Japanese as their language preference. This PDF explains how to change your language preference – Spanish and Russian versions are also available. As one of the most bio-diverse regions in the world, Japan has a wealth of knowledge to share on best practice animal care and conservation management. Launching the Japanese ZIMS version is a critical step toward expanding collaboration and knowledge sharing between the Japanese and worldwide zoo and aquarium community. This important initiative was made possible by the successful collaboration of JAZA, our Japanese members and Species360. The project was accomplished through the dedicated support of our team of fourteen Japanese volunteers, three translators in the US, and leadership from the Japanese Association of Zoos and Aquariums (JAZA). Special thanks go to Etsuo Narushima, DVM, JAZA Executive Director; and Yutaka Fukuda, DVM, Ph.D., JAZA Chair. Without the continuing support and commitment from JAZA, this endeavor would not have been possible. Japanese Association of Zoos and Aquariums (JAZA – http://www.jaza.jp/english.html) is the unifying organization for the Japanese zoo and aquarium community. Comprised of 150+ members, JAZA’s mission is conservation, education, scientific research, and recreational outreach. They are now in the 5th year of their “Museum of Life” vision to convey to visitors the wonder and frailty of threatened wildlife. Successful animal care depends on applying the best actions possible for long-term animal health and survival. And that means tapping into the best knowledge available. As a nonprofit serving our community for more than 40 years, Species360 continues to advance knowledge sharing for excellent animal care and conservation. Today, nearly 1100 zoos, aquariums and other wildlife member organizations in 90+ countries use Species360 ZIMS software to help them achieve best practice animal management and conservation goals.